Right before the end of the year, I got back into a painting mood. This mood change was prompted by the deadline of an upcoming show. A few years ago I had ordered some blank decks, but the opportunity to work on them had never arisen before. I stared worked on two decks, and regularly posted work-in-progress shots to my Facebook pages (Allan’s page and Alarment.com’s page) and got lots of positive feedback. So much so that one of the decks sold before being completed while a third was commission in a similar style by an artist friend. So I only ended up competing one skateboard deck to be included in the show. 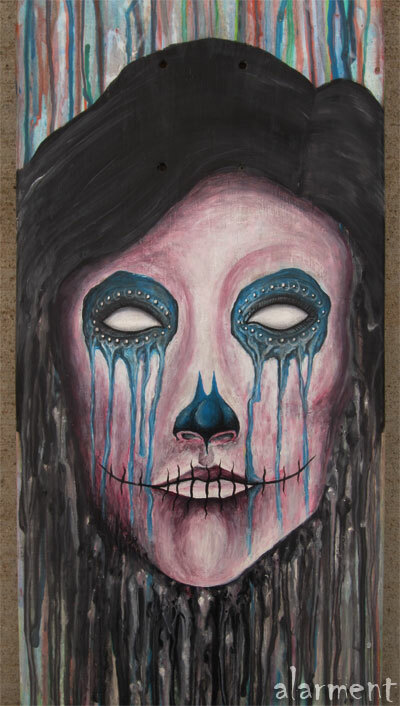 It is titled La Tristeza, and can be seen below. I will post more images of the other decks when they are done. Again, my Facebook pages are the best way to follow my progress on uncompleted works. The show opens Friday, January 6 and runs to January 27. If you are in the area, stop by and see my deck along with the works of many other talented artists. This entry was posted on Thursday, January 5th, 2012 at 4:09 pm	and is filed under Painting. You can follow any responses to this entry through the RSS 2.0 feed. You can leave a response, or trackback from your own site. Does “La Tristeza” mean the sadness? If so, I think it’s a very appropriate title for this piece;) Good work buddy!